If you are going to teach your dog to have a job, if you want to own a Working Dog, USE THE CORRECT AND WELL FITTING, SOUND, STURDY EQUIPMENT to train and to perform the work you would like the dog to do. Make Sure, Make Darned Sure, that YOU know how the equipment works, that is, how to use the equipment before you ever involve the dog. 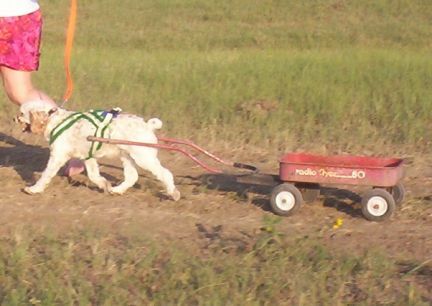 As far as Working Dog Equipment, the job dose not matter, the training does not matter, what matters is, whether you will be using a Sled Dog Harness for pulling you on a Scooter or a Blind to Hide Behind for a Shutzhund Dog, Agility Pieces, even Swimming Polls or Ponds, ALL EQUIPMENT MUST BE IN GOOD REPAIR, SAFE AND STABLE! What does "good repair" mean? It means that even if the item is old and has been stored outdoors, make sure it is safe, make sure it has no sharp edges, no nails sticking out, nothing a dog or human could get hurt on. Never, ever use the terms "Oh it will be fine. ", or "We are only going to use it for a minute." "Don't worry about it. ", when it comes to equipment that you and your dog will be using for work or play. Let's start from the very beginning. All puppies, and or dogs NEED Equipment. 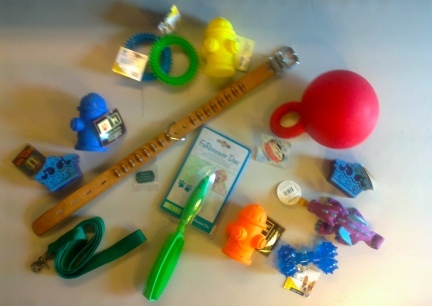 Any puppy and or dog needs a few good toys for chewing and chasing and playing with. An old sock is not a good idea. The puppy/dog will not know the difference between the old one you gave it and the new ones you just bought and paid high dollars on. So even from the beginning, right from the start, you need the right equipment. Even Collars and Leashes, the types and quality, matter. You do not want a collar or leash that will break as you are training your dog....or when the dog might be wanting to "go after" something or someone. You also want the correct Collar for the training you are doing at the time. A Shocker Collar is not for Obedience Training. Know what simple tools you need, make sure they are in "good repair", and fit your dog correctly, and maybe of foremost importance, that YOU know how to use them. This is a pile of Titus' "stuff" we bought for him before we even picked him up from his Breeder. When we bought Tekoa, to be picked up at the same time, the pile grew. It is a good idea to have a few thing (maybe not this many <grins>) bought ahead of time. Chew Toys are a must for puppies. It is how you train them NOT to chew on other items, and not to chew on you. Even the correct leash matters when you are out and about with your dog. Make sure that when your out with your dog you have it on a leash that will hold it even if it lunges forward with force. GSDs are very strong dogs. The same goes for the snap on the end of the leash, make sure it is a well made snap and large enough to handle the size dog you have snapped it to. When you are picking out a Backpack for your dog, there are many things you need to know. First of all, and perhaps most important, weigh and measure your dog. Some packs are sold by weight, others by the measurements of your dog. Buy the correct size for your dog. 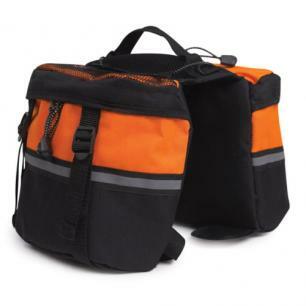 Make sure the pack is well made and underside of the pack is padded. Make sure the pack has THREE straps. One for the chest, two underneath the dog. Smaller dogs will only need one strap around their girths, GSD need two. It does not matter if you buy the type of pack you strap M.O.L.L.E. bags onto, or a bag you put items into, each of the two sides must weight the same. Don't leave hanging straps as you hike with your dog wearing it's pack. It is better to tuck the extra strap than to cut it off. This way, later in life, you could use this Dog Backpack on another dog you might own. That dog might need longer straps. When you are buying your harnesses for your dog(s) make sure that they are the correct size. Make sure the stitching is firm and even...on this. I have said in more detail below on this page "About Dog Harnesses" that it is not the "tinsel strength" of the webbing on Dog Harnesses, it is the stitching....you can have the best webbing in the world, but it is at the stitching where the Harness is likely to break. Make sure your stitching is firm and even. Never leave a dog unattended in a harness. Some dogs will chew on harnesses. If you see the dog's mouth near the harness, correct the dog. If your dog does chew it's harness, replace or repair the harness. Not only does your Dog's Harness need to be in "good repair", stitched very well, fit the dog correctly, it need's to be the correct Harness for the job your dog is preforming. Make sure you buy what you need for your dog to work in. Scroll down for more Harness Details below. You want your equipment in "good repair" so that it is safe not only for the dog, but for the humans around or working with the dog. Imagine a Flyball Box that was not working correct. If the balls did not fly out then the dog hit the lever, the dog would be confused and disappointed, thus discouraging the dog from the game and the training. If the Flyball Box would fall down when the lever was hit by the dog running into it, the dog might learn to be afraid of the box....game over. If the balls flew out and HIT the dog, the dog would also learn to dodge the balls and or be afraid of the box, again....game over. So not only do you need to make sure all equipment you use with a dog is safe, but that is operating correctly too. It needs to be checked each and every time you use it. And if something needs repair, fix it right away, don't wait and forget until the next time you are ready to use it.....you will be frustrated and disappointed. 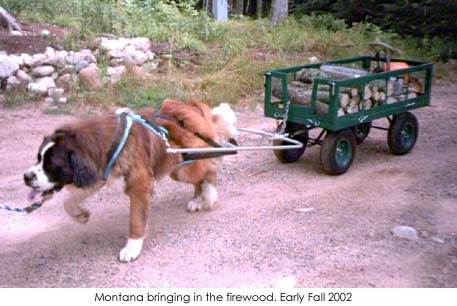 All of the above photos are of our own dogs pulling wagons. Each of these dogs are a different size, so, of course, we have different sized wagons for each to pull. They also each have their own harnesses for the job. With a vehicle with shafts, the shafts hooked correctly into the sides of your harness become your break. It is important that everything fits correctly. A wagon or other vehicle pulled by an animal needs to be in "good repair". You can see that Frankie's, the Cocker Spaniel's, wagon is older by the time he was pulling it. But it was sound and stable and safe. But sometime after this photo, one of our horses stepped in the middle of it. <sighs> I had to send it to the trash. Old, need paint, those things are not near as important as stable and in working order. Imagine a dog, especially a big dog, pulling a wagon that had a loose wheel or a rusty bed. If you set a child, or adult, or load into this wagon, it could, probably would, break. The noise of the breaking and or the feel of the broken wagon could, and probably would, spook the dog. The dog would probably run, or twist. The dog could be hurt, the person in the wagon could be hurt, and it nothing else, your load could be spilled. Not a great thing, not a good picture! And to top it all off, your dog could be ruined for pulling in shafts or out, for life. We have information on how we make our metal shafts for dog/goat wagons on our "Cart & Wagon Dogs" page. You would never want to train your dog for Agility or Schutzhund or Tracking on an unstable or shaky, or slick or skinny A Frame. It would be too unsafe. This is how you need to think of all Working Dog Equipment. You want good stable, well kept up, safe equipment, no matter what type of training or work your dog is doing. 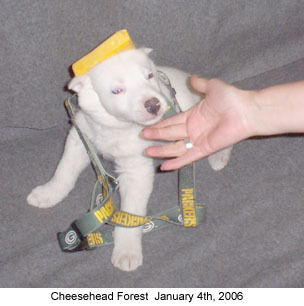 There are specifications and plans for most dog equipment on the Internet or in Books. They created these specifications for a reason....the safety of all involved. Please Do NOT skimp when it comes to safety. There is a reason that Working Dog Equipment is expensive. When it is made right, when it is made safe, it takes the right and correct supplies to put it together. But you want the right and correct and the safe and albeit expensive Working Dog Equipment. 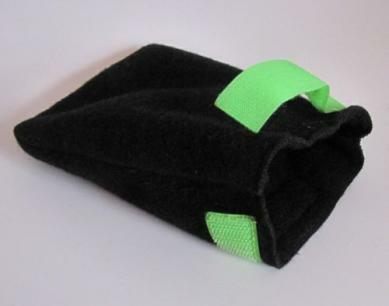 This Protection Dog Sleeve, commonly used in Schutzhund training for Bite Work, will give you something to think about. What would you rather have on your arm? This? Or just that long sleeved shirt and winter coat you already own? Yes. The Right Equipment in "good repair" matters! Agility Equipment needs to be safe and stable to use for your dog. If you are building it yourself, a great idea, make sure it is up to the standards and specifications for the item. This jump is made so that if the dog's foot or leg hits the bars they will fall rather than hurt the dog's body. 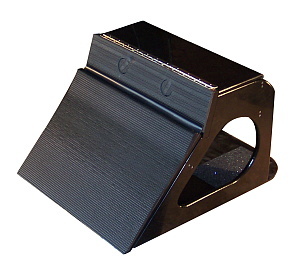 There are many types of Agility Equipment Plans and Specifications on the Internet and in Books. 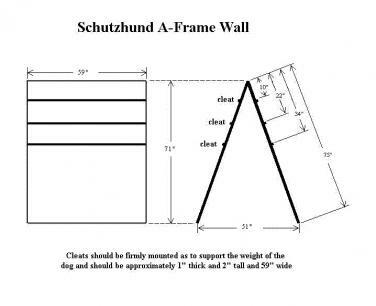 If you are going to build your Agility Equipment, build it correct and stable and safe for your dogs safety. 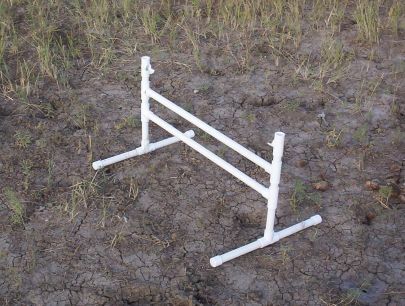 There are many fun items you can use to teach an Agility Course to your dog at home. Many items can be used and used safely. Make sure what you are using measures up. Your dog trusts you for it's safety. Have Fun but Be Safe. Any time you buy an item that your dog will be using, you really need to stop and think about how it is constructed. 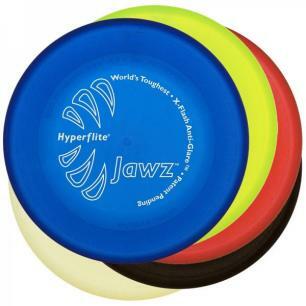 Even something like a Frisbee. And did you know that you are not suppose to leave a dog alone with a Frisbee? Not only for training reasons, but you do not want them to chew it up before the game has started. 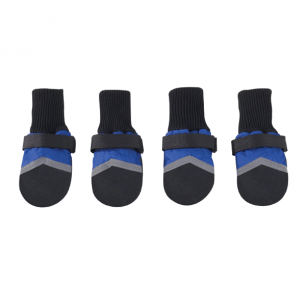 Dog Booties, that are the correct type and size can be very important for Working Dogs and or dogs that have injuries to their feet. 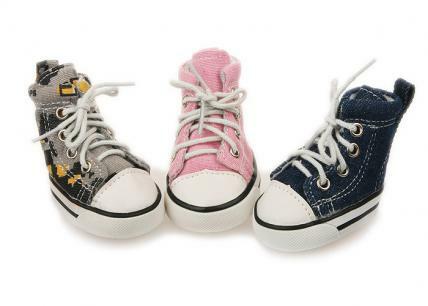 However, Dog Shoes for Fashion may well INJURE your dogs feet, joints, and or bones. I was appalled in 10/2013 when I saw, on a show called "The Dr.s" a so called "Specialist", I believe they said he was a Veterinarian, that was showing <read selling> Dog Booties, or as they called them "Shoes" or "Sneakers" for dogs. He did not know about sizing, or that you should NEVER put only one bootie on a dog, or that snug fitting is important! Some "Expert". They went on to say how wonderful these are for dogs with Hip dysplacia and other bone problems. This is NOT true! Further, the set of "shoes" they had to demo DID NOT FIT THE DOG they had wear one. I was more appalled when I looked on line and saw all the different ridiculous dog shoes for sale. First of all, a dog is a dog is a dog! God made their feet really really tough for all terrain. God made their toenails sit on their feet as he did for a purpose! Shoes for dogs are not something a dog needs and can actually HURT their feet and joints and bones. 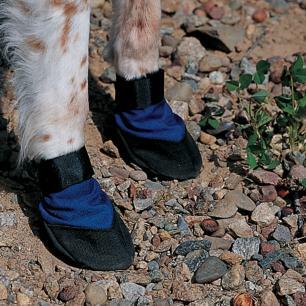 When a Working Dog needs to wear booties, like out on a rough sled dog trail, or working on gravel, or hunting in briars, they need a good bootie that fits correct and flexes with their foot in all the directions their feet flex. The toenails need to be (trimmed first) fitted into the booties and tucked in with a person fingers down into the front of the bootie. The bootie needs to have a enough velcro around the band so that it can be shut snug with no velcro showing, but also none hanging loose. You do not want the velcro to hang or not be covered, so that the dogs hair is not pulled by it, nor can the velcro be pulled off by the dog or other items it might walk past and brush up against. 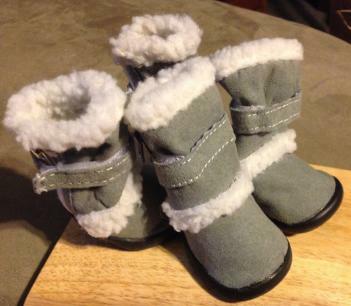 The booties need to be simple with few stitches, that might aggravate the dog's foot. The bootie needs to fit just up to the ankle and no higher. Any lower, it would not close correctly, any higher can hurt the dog's ankle and or movement. Impeding the movement of the ankle can irritate the dog's leg and even stretch the muscles and or tendons at that joint. If you boot one foot, front or back, boot the other foot opposite from the injured foot. This way the dog will continue to move, walk or run, evenly on it's body. If you only put on booty on a dog, it will walk differently, much like a limp. This twists the dog's body as well as puts more weight on the unbootied foot than the other. Use the same type, same age (not one worn down and the other new), on the dog at the same time. This way, again, the dog will not throw it's weight to one side or the other. 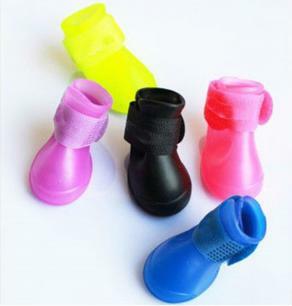 By using these new cutesy booties a dog's foot or feet can be inured from improper fitting and the way the shape of the booties are made. Other ways these cutesy dog shoes can hurt your dogs body.....zippers can pull the dog's hair, the ties can get the booties too tight and cut off circulation, plastics can add sweat/moisture to the dog's feet making them not only slippery inside the shoe, but also cause irritation between toes. Dog Toenails were not meant to be placed inside a dog booty. First of all I can not stress enough how important it is to keep your dog's toenails trimmed. If you have the wrong type, the cutesy type, of dog booties on your dog's feet, their toenails can and will be stressed to the point of hurting them, pushing and pulling the nails around the shoe with each movement. This injury is not one that will stop once the booties are off the feet. This type of injury is going to hurt the dog for up to weeks. Dew Claws, those little toes above a dog's foot, to the inside of the leg, that grow a nail, are usually removed in Working Dogs. Most people that have Sled Dogs remove the Dew Claws specifically for the problems that can arise with them when Booties are put on a dog. The booty should rise above the Dew Claw, this means the booty will be snug around it. With some movement the Dew Claw will move around under the booty and rub the leg, making both the leg and the Dew Claw sore. If the nail is long on the dew claw inside a booty, the nail might just cut the leg as the dew claw moves inside the bootie. 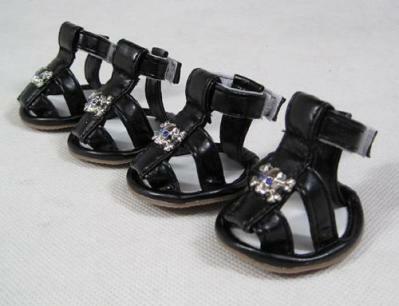 The worse, the very worse, the most likely to harm or injure your dog, the Dog Sandal! How stupid these are! Everything about them says injury for a dog's foot/feet! Not only do these hold the foot all wrong for the dog's movements, these shoes will let and hold in rocks, mud or anything else from the surface that might harm your dog's foot. These shoes will surely hurt the dog's toenails, there is no way these shoes can fit right and hold the toenails as they should be held in a good booty. To top that off, the dog could surely step into the shoe of another foot it is walking in and CATCH it's nail within that shoe. These shoes SHOULD NEVER EVER BE WORN BY A DOG! They are very unsafe! YOU MUST USE THE CORRECT HARNESS FOR THE JOB THE DOG IS PREFORMING AND THE HARNESS MUST FIT THE DOG CORRECTLY. I get harness questions all the time. The main thing I am asked is why a dog can not use an X-Back harness for their dog to pull a wagon with the tongue of the wagon. The X-Back harness will come up on the dog, and might in fact come over the dogs head and off the dog, when the wagon is going down hill or the dog stops. Wagons need shafts for brakes, but even with shafts, the X-Back harness will slip up and probably over the dogs head when the dog stops or going down hill. No, you can not use your X-Back on your dog for it to pull a wagon or a child's sled. No, that harness you had for your Siberian Husky is not going to work for your Pit Bull or Saint Bernard or Cocker Spaniel. I get these questions all the time....mostly people want an "inexpensive harness that will work for anything the dog might pull". Guess what? Inexpensive is relative and there are no cheap ways to keep your dog safe while you have a bit of fun. AGAIN, YOU NEED THE CORRECT HARNESS FOR THE JOB YOU WOULD LIKE FOR THE DOG TO DO AND IT NEEDS TO FIT THE DOG CORRECTLY. 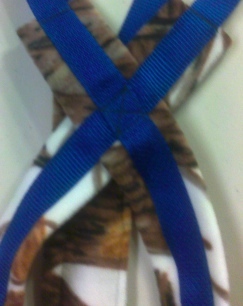 Harnesses for any animal cost real money. The reason is that they are usually made well with good grade materials and take time to make. Using the wrong harness and or the wrong equipment can not only get your dog injured, but you might just get hurt too. The Siwash Harness is probably the oldest style know to man. Eskimos have used these for mannnnnnnnnny years, probably 1000s of years, and they are still being used for a reason. They are WONDERFUL HARNESSES, they work well, last long, are easy to use on the dogs, easy to wash and store, and look good on the dogs. These are used for sleds, rigs, scooters, a person in skates being pulled by a dog, and the like. The X-Back Harness is really a Siwash Harness with an X on the dog's back that makes the harness fit a bit better. It takes the Siwash Harness that in sizing could be compared to a woman' pants, in sizes Large, Medium and Small, and makes it more, with the X-Back, of a size, like a size 10 or 12 or whatever. The uses are the same as a Siwash Harness, the padding is the same, it is the same harness with an X on the back. There is a difference between a Weight Pull Harness and a Freight Harness. 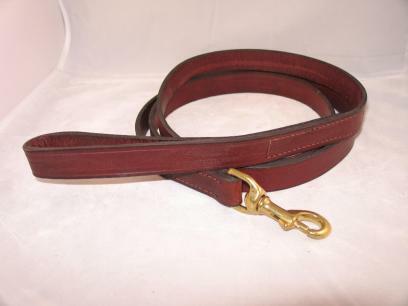 Although they are made the same, Weight Pull Harnesses have double padding around the neck. If you are weight pulling and want to win, get a double padded Weight Pull Harness. Personally, I like the Weight Pull Harnesses for working around the farm too. 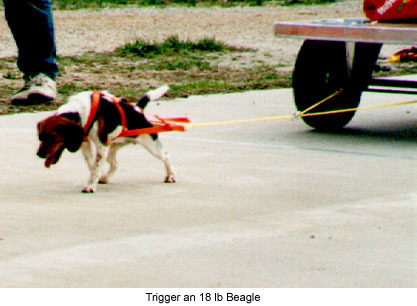 A Weight Pull or Freight Harness is used for pulling weight in competition, pulling a sled (only if well trained, untrained dogs can really get hung up in the back area of the harness), if it is converted (pieces added) you can also have your dog pull a vehicle with shafts, but the back bar also needs to be hooked into the vehicle being pulled. I designed this multipurpose harness for my Labrador Retrievers years ago when I first got my sacco cart. I was so excited about getting a ride in my sacco cart. I put a "D" harnesses on each of the two dogs and told them to go... they both "stepped out" of their "D" harnesses and there I sat in the sacco cart with the harnesses dangling while the dogs ran off. They did come right back when I whistled, but I knew these D Harnesses were not going to work. 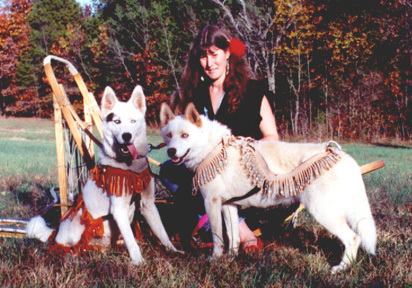 I had been a Sled Dog Harness Maker for several years, so it was time to design. They say that necessity is the mother of invention and so I went to the sewing machine with an idea. 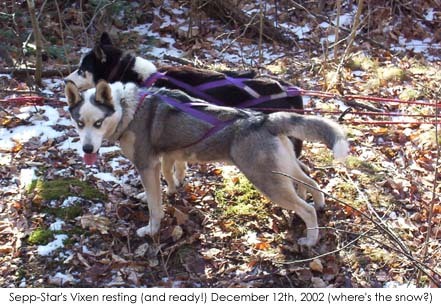 Not only can you use this type of harness for sled, rigs, carts, wagons, and travios, but also for dogs to pull you in a boat, on a scooter, or on skis or skates. Truly a Multipurpose Harness. It has one "ring" on top, and two sets of two for easy hook up to what ever your dog will be pulling. The snap is on the top of this harness so when the dog is in water, if caught in a tangle, you can free the dog in an instant. This harness is usually completely padded with double padding under the snap. Yes, the photo is of a goat. I could not find one of our dogs using one. 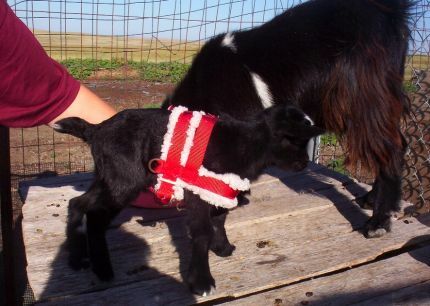 I have not used this type of harness for dogs or goats in maaaaany years. It is a good harness for teaching your animals to wear a harness. These harnesses are modeled after the old style walking harnesses. This type of harness can be used for wagons, travois or any vehicle with shafts on both sides of the animal. 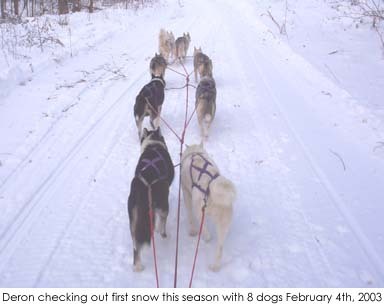 Most, if not all, sled dog harnesses today are made with either a poly pro or nylon webbing. There is a reason for that. Leather is nice, however, it will stretch, especially when wet, and your dogs might just eat it. Cotton, when wet, stays wet for a long time. Nylon and or poly webbing is not only strong, it is non absorbent so that it will dry quickly if it gets wet holding the size it was when made. 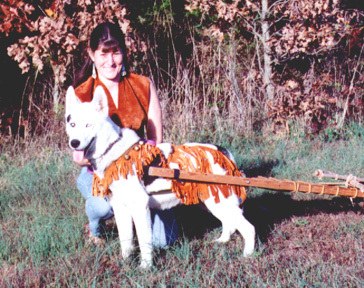 I remember when I first started making harnesses the padding was made with Fake Fur. Now the best stuff to use is a good grade Polar Fleece. Polar Fleece is not only non absorbent, but also is easy to wipe dirt and mud off with just a wet rag. It makes good padding and a good grade will last for many years. Most harness makers use either nylon rope or parachute cord on the back of harnesses for the hooking area called the ring. Again, great stuff, last long and cleans up well. Of course, again, non absorbent. I have added bells, and beads and conchos and the like to harnesses for years. I do not sew them on, I "weave" them into the harness under the padding. Items sewn on to harnesses will work their way off, won't last long. Webbing harnesses are easy to wash and look like new when finished. I wash mine in THE WASHING MACHINE with settngs on cold, warm or hot water in with a load of towels....be warned, your padding might fade. I recommend washing the harnesses on cold or warm. DO NOT MACHINE DRY! Hang your harnesses by the loops for 24 hours. I dry mine indoors, but drying them outdoors is fine too. If your webbing is kept clean, your harnesses will last for many years to come. Your harnesses will be longer lived then your dog....so I never recommend putting names on your harnesses. If you decide to make your own Dog Harness keep in mind that the stitches MUST be very strong. Your harness is only as strong as your sewing machines weakest sewn area. I get a kick out of "webbing strength" being used to describe harnesses, it should be "stitch strength", because the area that is most likely to break on an animal harness is where it has been sewn together. You also must use a good strength thread. You can buy nylon webbing where you can buy fabrics and craft items. But before you buy the webbing you are looking at, double it over and decide if your home sewing machine can handle and/or pull the webbing though as it stitches. Now, keep in mind that you will have areas on the harness that not only has two or three layers of the webbing but also a doubled amount of padding too. NOW?? Can your machine handle that? You must use a heavy duty needles. Your new needles will break the thread over and over while sewing the webbing until the needle head is "broke in". I have sanded the head of the needle to stop this, but you must remember that you DO need a needle head. If you file the needle do so a little at a time. By the time you have bought you webbing, padding, needles (get at least a four pack because you WILL break needles), buckles, slides, metal rings, thread and whatever else needed for the type of harness you will be making, you may be spending as much as you would to just buy the harness. Price everything you need before you start buying parts. If you decide to make your own harness, prepare to be frustrated. Making a Dog Harness will take some time, probably more of your time then you think. Not trying to scare you off, really I am not, but I have met far too many people over the years that have decided to make their own dog/goat/llama/pony harnesses that these folks have just thrown or given away the stuff they bought to make their own and bought a harness professionally crafted outright. Now, what are you using for a pattern for your harness? It is very hard to make a correct harness by looking at a photo. Making your own Dog and other animal equipment is fun and rewarding. If you have the time and can sew you might just save a bunch of money making your own equipment. You will be able to pick out your favorite colors right down to the snaps and or thread. You can make the item the way YOU want it to be made. You can make it a bit bigger if you have an unusually large or make it smaller for a little bitty dog. 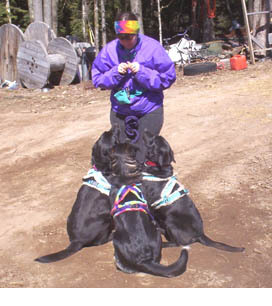 You can make matching harnesses in bright colors for each of your dogs. You can ad buttons, bows, bells, thicker padding or whatever to your item. You can also surprise a friend of yours with a nice Christmas or other Holiday gift. The same <as above> is true for any type of equipment you choose to use with or on your dog when you are working it. It does not matter what Sport or Activity you and your dog participate in. Any of the Equipment you choose, and it is all up to you, the last word of the equipment used on or with your dog, is up to you. Your dog counts on you for it's safety and well being.